Do you know what my kids fight about most at dinnertime? The biggest point of contention at our dinner table is about who gets to sit by MOM! Anyway, while I was visiting family in Colorado last week, I spied a book that my MIL had set out on the breakfast table for us sisters to discover. (Incidentally, it's called Walking into a Hug.) It's a journal/workbook that helps you to create a more embracing home over a 52-week period, by implementing one new habit each week. I read through the book that afternoon and took notes of suggestions I thought would help us/me to create a more loving atmosphere. I also wrote down any impressions that came to me about our home-life that were not in the book...and there were a LOT of them. One of them was a possible solution to making table-seating fun instead of a fight. I didn't like the idea of having set seating. It's boring, predictable, and too top-down for me. Plus, given the fact that everybody wants to sit by me, I didn't want to have to "choose a favorite" to get that "privilege." So, instead, I thought why not pull numbers every night before we sit down to determine where we'll each sit at dinner? That way it mixes things up, creates an element of anticipation and surprise, and takes the pressure off of me to break up quarrels and crying over who gets to sit where! We introduced this new "dinner game" last night before dinner/FHE, and I think the kids enjoyed it. At least...no one cried! As dinner was winding down, I started discussing our family's schedule and how we'd work in our chores and fun time around school drop-offs and pick-ups and homework and such. I presented some time dilemmas that we are facing and asked them to help come up with the best way around the problems. They enjoyed giving their input into how our mornings and evenings together will go in the fall. Then I asked them to tell me other fun things they'd like us to do together as a family on the weekends. Guy had a lot of suggestions which revolved around each child getting alone time with Mom or Dad. To wrap up our family home evening together, I told the children that I had a surprise for each of them. While I was in Colorado, I spotted these cool closet organizers at the Current outlet for $8 each! There is a slot for each weekday, where the kids can lay-out their school clothes and gather items they might need for special things happening each day. The kids were thrilled with their back-to-school presents, and I am looking forward to seeing them use these things to organize their ever-expanding lives! 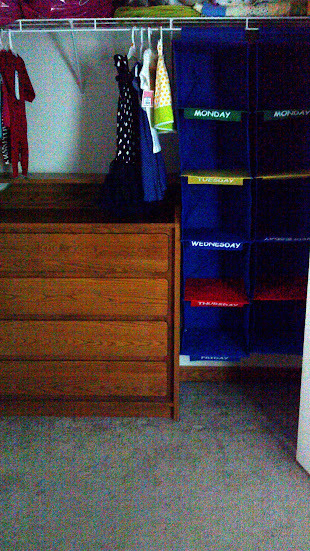 Now if only Guy and Autumn had a closet in their new bedroom, we'd be all set! I'm working on that! We start school next week, so our next FHE will include back-to-school blessings from Dad! Check out more FHE reports from That Good Part! A Dish Solution that has helped us keep dirty dishes to a minimum. So glad to know there is an alternative to "Sit down and shut up." ha! Yes, good to know! :) And I've been searching for the alternative for a while now! I think I'll check that out for sure today, thanks, Edye! We did too especially when we were older...this seemed like a fun way to deal with the problem especially given their ages and proximity of ages! I like the idea to change up seating. That's something to think about as our family grows! Our son uses one of these days of the week things for school clothes. It's so easy in the morning. My kids fight over me too! They trade off weeks getting to set the table and the person who sets the table chooses where everyone sits. It has solved a lot of the crying/fighting for us...as long as my son doesn't set the table only to change it once he realized his sister is happy with where she is sitting. what a cool mom you are...I could have used these ideas when I was raising my four boys...lol! My kids usually just sit in the same spot, not because we made them or told them they had to, they just do. However, or fight at each meal is who gets to say the prayer. Actually every prayer is a fight, "she said it last time" "I never get to say it". I am glad they want to pray, but in a family of only 4 with more than 4 prayers in a day, we can get in trouble. When I read your posts it brings back memories of raising my own children. There are so many examples that are similar. You have such great ideas. I love your pictures and thoughts to day. Blessings to you all! Moms are always popular, but mostly it's for clean up on isle four, or a kid got something stuck up their nose or to settle a spat over a play object. It is fantastic to be popular at the dinner table. Way to make a mom feel loved kids! When they are teens this will be a great post to share with them so they remember when they use to fight to sit next to Mom. Not sure I have too many suggestions at this point. I normally try to have a yummy snack for them and let them run around outside. I also try to have some sort of coloring or activity for them to do with me as it facilitates them discussing their day. Hot chocolate and marshmallows in winter gets them talking as well. Now the kids will have homework which they didn't have last year, so it'll be a whole new ball-game. Guess I'll have to wait and see how it goes! We always sat in the same places at dinner too...I have no idea who decided where we'd sit or why. We also held hands during the prayer...a tradition we carry on today. There were days when I REALLY did not want to hold the hand of the person next to me...and other times we squeezed hands a lot during the prayer.